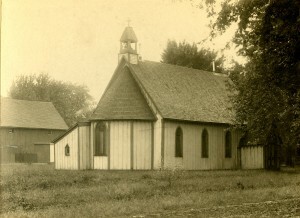 The 1917 Trinity Episcopal Church replaced an earlier board and batten Episcopal church (the old church is seen on the left) that had stood on the same site since 1870. The original church ran east-west across the two lots it was built on and it was entered through a porch on the building’s north side, facing Harrison Street. 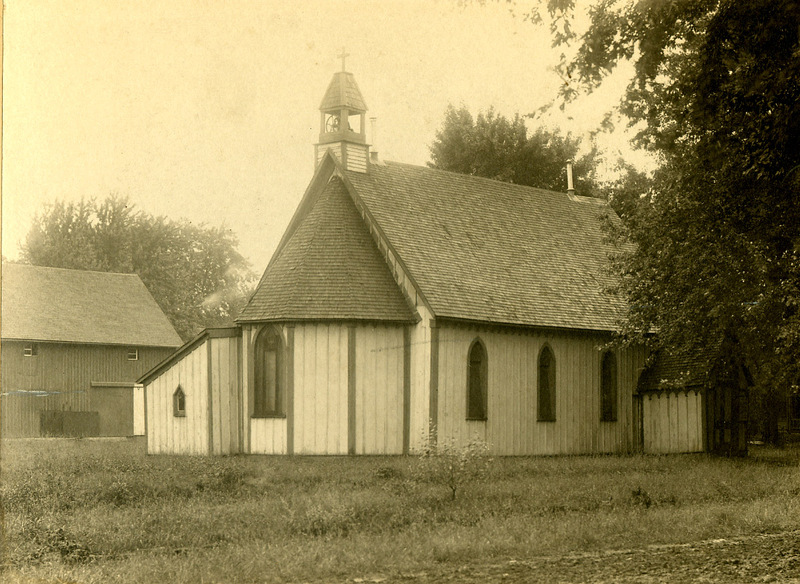 A fire damaged the original wooden Trinity Episcopal Church in March 1907; emergency repairs were effected but the building remained in such poor condition that the congregation petitioned the Diocese for a new structure in October 1915. A local committee selected Irwin Dunbar, a member of the congregation, as architect after an agreement on financing the project was reached between the Diocese and Trinity. The old church was razed in 1916 and by October of that year, Dunbar had drawn up plans for a new building. The construction, done by the firm of Eggert and Russell from Kirksville, moved forward rapidly: the cornerstone for Trinity Episcopal Church was laid in May 1917 and the completed church was consecrated on 7 November 1917. The building cost $11,555 “with everything in it”  and the cost was split between the Diocese and the mission. Typical of his work on other buildings in Kirksville between 1914 and 1917, Irwin Dunbar’s design for Trinity Episcopal Church adeptly combines the spatial needs of a small congregation with solid craftsmanship and sensible artistic values. Dunbar achieved this at Trinity by combining different architectural forms and styles, namely Gothic Revival and Craftsman. The exterior and interior arrangement, as well as the furnishings, demonstrate the building’s faithfulness to architectural guidelines laid out in England by the Cambridge Camden Society during the nineteenth century. As a rural, mid-western outpost of the Episcopal Church, the Gothic design for the 1917 Trinity helped it project a particular religious identity. It looks like an Episcopal chapel. 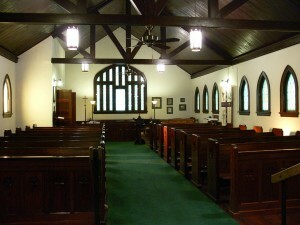 But while Trinity Episcopal Church participates in an established tradition of Gothic Revival churches in the Diocese of Missouri, it is unique among Episcopal chapels in Eastern Missouri in its free and graceful mixing of Craftsman and Gothic styles. Set in a residential neighborhood, Trinity’s scale and Craftsman characteristics help it blend in with the surrounding bungalow-style domestic architecture. The Craftsman style is evident on both the building’s exterior and interior. The church’s horizontal lines are emphasized by its gable roof, the course of stone between the basement and the main floor and the windows clustered in threes to create long bands. The deep eaves, purlins, rafters, and rough brick are among the other Craftsman elements on the exterior. The meditative, uncluttered feeling of the interior space is achieved through the trusses, white plaster, extensive use of black walnut, stained glass and good workmanship. The simple stained glass reflects the economic realities of a small congregation with limited finances in 1917. The remarkable ceiling trusses in the nave bring together both Craftsman and Gothic Revival aspects (the simple, box shapes of the former and the desire for an exposed beamed ceiling in the latter). Trained as an engineer, Dunbar’s use of trusses is also a practical solution for carrying the weight of the now ninety-year old English-tile roof. The Cambridge Camden Society promoted certain Gothic Revival forms and details in Episcopal churches. These features are much in evidence at Trinity: namely, the side entrance to the building through a porch (rather than straight into the church through an entrance directly in line with the altar) and the lancet and four-centered arch windows on the exterior. The large four-centered arch windows, located at either end of the nave and in the transepts, are really just simplifications of the Perpendicular Gothic style of architecture, an architectural style the Cambridge Camden Society championed for Episcopal churches. That period of Gothic design works well with the square-angled Craftsman features in our building. The interior arrangement of the nave and chancel are entirely in keeping with the recommendations of the Cambridge Camden Society: a center aisle, visible separation between the nave and sanctuary at both the floor and ceiling levels, a deep chancel, aumbry and a communion rail. The Building and The Diocese In 1871 the Diocese of Missouri adopted a distinction between parishes (autonomous congregations) and missions (dependent on the Diocese). In an evangelizing effort to spread the Gospel and develop branches of the Episcopal Church, several missions where opened across Missouri in the early 1870s. Trinity Episcopal Church was just such an establishment. The greatest growth in the Episcopal Church in Missouri coincided with the state and Kirksville’s greatest population growth, 1870 to 1900. Trinity Episcopal Church was founded as a missionary station in 1870. The small, wooden, Gothic-styled church erected in Kirksville was constructed as part of a larger parish that covered seven counties in Northeast Missouri and the 1870 Trinity resembled those buildings constructed at other mission churches in northern Missouri in the early 1870s, for example, at Clarksville, Pike County and at Louisiana, Pike County. All three of these resemble the wooden churches for missions too poor to afford an architect that appeared in Richard Upjohn’s Upjohn’s Rural Architecture (1852). The model of the small English parish church advocated by the Cambridge Camden Society continued to be the design source for Gothic Revival churches in the Diocese of Missouri throughout the late nineteenth-century: for instance at Trinity Episcopal Church (1858) in Hannibal, Marion County and its remodeling in 1899; St. Paul’s Church (1880), Palmyra, Marion County; Church of the Redeemer (1893), St. Louis City; and Calvary Church (1899), Columbia, Boone County. Architects and building committees in the Diocese of Missouri continued to employ Gothic Revival in the twentieth century as seen at St. James in Macon, Macon County built in 1901 and St. John’s, St. Louis City in 1907. Even the Episcopal churches in the Diocese constructed immediately before or at the same time as Trinity — St. Michael and St. George (1913-1929); Epiphany Chapel (1917); St Mary’s (1918) — continued the trend of Gothic-inspired designs. In fact, St. Michael and St. George, a massive Gothic church in St. Louis, represents the climax of proper ecclesiological design in the Diocese. 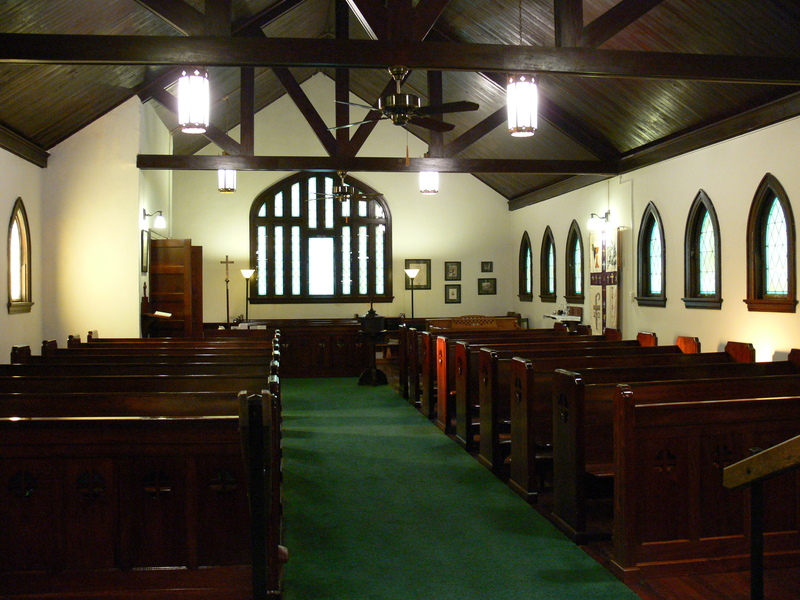 Trinity’s place in the architectural development of the Diocese’s chapels is important: at the time of its construction, Trinity was participating in an almost sixty-year old Gothic Revival tradition for Episcopal churches in Eastern Missouri. Trinity’s incorporation of Cambridge Camden principles, therefore, helped it demonstrate an architectural style immediately identifiable as Episcopalian. Likewise, Trinity’s rural location at the very edge of the Diocese made its use of Gothic a critical decision in establishing its identity and heritage. The Building and Mission at Kirksville Although the Kirksville business community constituted the core of Trinity’s membership in its beginning, the congregation has long had strong connections with Truman students, staff and faculty. In 1923, for example, 120 Truman students attended Trinity. Historically Trinity also has a strong connection with St. James, Macon. The Rev. Dr. Ethelbert Talbot from St James served as our priest on three separate occasions – 1872-1874; 1878-1881; 1883-1887. Moreover, our current baptismal font came to us from St. James, Macon upon that church’s closure. As early as 1903, Trinity’s priest, the Rev. Mr. George Preston, found the “old frame structure which is not, and cannot be made comfortable and is wholly inadequate.” However, his plan to “begin at once to build a modest building of brick and stone” never happened. Instead a fire in 1907 damaged the roof, making the chapel even worse. Nonetheless, the congregation continued to meet in a poorly repaired structure for several years. In September 1915, the Rev. Mr. Rufus DeLancy Putney was appointed vicar of Trinity, the first priest to serve there since 1910; he found the building beyond repair and sought and obtained permission for a new church. The timing was deliberate. The Diocese pledged monies for the rehabilitation and maintenance of Kirksville as a missionary station for four years succeeding 1914, the same year Irwin Dunbar graduated from the University of Missouri, moved to Kirksville, began practice as an architect and started attending Trinity Episcopal Church. Given the combination of a decrepit building, an experienced architect in the congregation, a congregation willing to move forward, monies promised from the Diocese, and a new priest, Putney wasted no time. His petition for a new church came one month after assuming his duties at Trinity. While the new church was under construction, services were held at the Elks Club, the Princess Theater (now Sieren’s Palace). Dunbar had just designed this building for Mrs J.M. Kennedy, (a member of the Building Committee), and a funeral home. On 14 May 1917 the cornerstone of the new brick church with its undercroft for parish activities was laid by the Right Rev. Bishop Johnson assisted by the Rev. Mr. Rufus Putney. 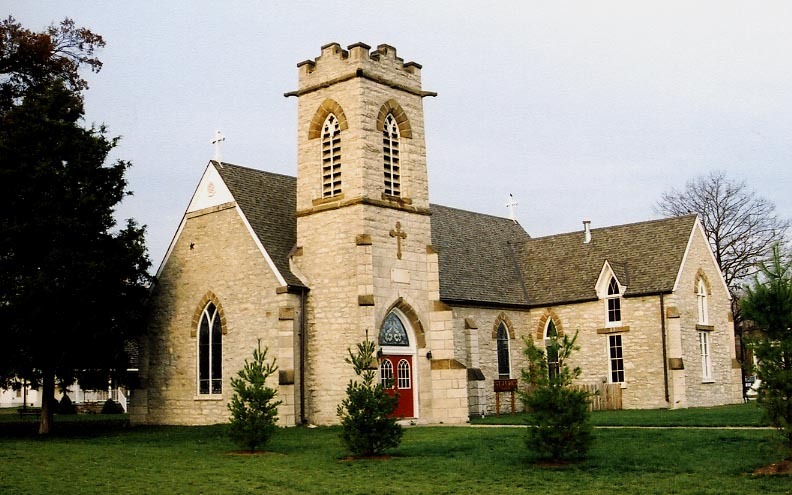 Six months later Bishop Johnson returned to Kirksville and on 7 November 1917, Trinity Episcopal Church was consecrated by Bishop Johnson assisted by the Rev. Mr. Putney and some of the clergy of the Northern Convocation. The departure of the Rev. Mr. L.C. Sherburne as Trinity’s priest in 1926 was a blow to the congregation. Because of outstanding debt, declining attendance and lack of clergy, the Diocese authorized Trinity’s closure and deconsecrated the church in 1928. In 1929, Diocesan Convention ordered mission property at Kirksville sold. Fortunately for Trinity, the onset of the Great Depression coincided with the deconsecration; there were no buyers for dormant churches located in the rural outposts of the Diocese. In 1939 several members of Trinity went to St. Louis to request the Right Rev. Bishop Scarlett to re-open the church, which he did. The Rev. Mr. J. Presly Pound, St. James, Macon, took charge and held services here semi-monthly. Once again, Trinity Kirksville owed its resurrection to Macon clergy. Since the 1940s Trinity has remained open as a mission church, its congregation has slowly but steadily grown and it has been an active participant in Kirksville’s religious life. Some examples of the relation between Trinity and various communities are its opening a day care service in 1960, reactivating the Canterbury Club, for college and medical students in 1961, making and selling incredible Easter eggs, helping Hope’s Kitchen and the Kirksville Food Pantry, and supporting Victim Support Services and Habitat for Humanity. The oldest Kirksville building in continuous use as a church is the A.M.E. Church, now the Bible Missionary Church, at 508 South Main which dates from 1878. Unpublished correspondence between Trinity Episcopal Church, Kirksville, MO with the Rt. Rev. Frederick Johnson, Bishop of Missouri, dated 1917. 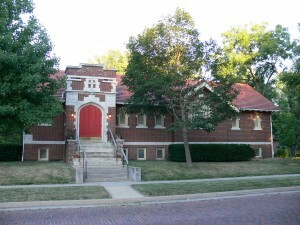 Archives of the Diocese of Missouri, St. Louis, MO. In the nave, the church also displays photographs of the 1870 churchÔøΩs exterior and interior, its 1873 charter from the Diocese of Missouri and other documents relating to the congregationÔøΩs founding. Furthermore, Trinity still possesses the bell (cast by the noted firm of G.W. Coffin & Co., Buckeye Bell Foundry, Cincinnati OH) from the 1870 church. Oddly, there is no indication that Dunbar planned to incorporate the bell into the 1917 church at all. By 1886, The Diocese of Missouri had 40 missions, Kirksville being one of them, and 51 parishes. The Rev. Mr. Scheetz drew the plans for at least four churches in Missouri, all of them Gothic: St. JudeÔøΩs, Monroe City; Trinity, St. James; St. MarkÔøΩs, Butler; and St. PaulÔøΩs, Lee Summit. St. JudeÔøΩs and St. PaulÔøΩs are on the National Register of Historic Places. Trinity is among of the last churches in the Diocese of Missouri to use the Gothic style as well. Six more Gothic churches were built during the 1920s and 1930s. Then, Diocesan architecture shifted: the next chapels built in the Diocese of Missouri were a show-stopping Art Moderne (St. MarkÔøΩs, St.Louis County in 1938) and two Georgian Revival engaged axial tower structures (Grace Church, Clarksville, Pike County in 1940 and St. PeterÔøΩs, Ladue, St. Louis County in 1949).